Virat Kohli born 5 November 1988.He is an Indian international cricketer who currently captains the indian team in Test Cricket and is its vice-captain in limited over formats. He is an Indian International cricketer, who is a middle-order right hand batsman and a right arm medium pace bowler. He was the captain of the champion Indian team at the 2008 Under Ninteen Cricket World Cup held in Malaysia. Virat Kohli has been the recipient of many awards such as the ICC ODI player of the year 2012 and the BCCI’S international cricketer of the year for the 2011–12 and 2014–15 seasons. Virat Kohli is dating Bollywood actress Anushka Sharma. But the couple is not able to sort out differences between each other and this is resulting in constant and endless fights. Owing to their busy schedules they are not able to spend time with each other. Virat Kohli was born on 5 November 1988, in Delhi, India, to Prem Kohli and Saroj Kohli. His father was a criminal lawyer while his mother is a housewife. Virat Kohli has two siblings: an elder brother, Vikash, and an elder sister, Bhavna. Virat Kohli became interested in cricket when Virat Kohli was a little boy. Aged just three, Virat Kohli would pick up a cricket bat and ask his father to bowl to him. Virat Kohli received his early schooling from Vishal Bharti Public School. Virat Kohli's interest in cricket continued to grow and his father had him enrolled at the West Delhi Cricket Academy when Virat was nine. Virat Kohli trained at the academy under Rajkumar Sharma and also played matches at the Sumit Dogra Academy. In 2002, Virat Kohli played for Delhi Under-15 team and became the leading run-getter in the 2002–03 Polly Umrigar Trophy tournament. Virat Kohli was made the captain of the team for the 2003–04 Polly Umrigar Trophy. Virat Kohli was selected in the Delhi Under-17 team for the 2003–04 Vijay Merchant Trophy. Virat Kohli scored 470 runs in four matches at an average of 117.50 with two hundreds. Virat Kohli repeated his fabulous performance the next season too, and helped Delhi lift the 2004–05 Vijay Merchant Trophy. Virat Kohli's consistent performances earned him a place in the India Under-19 squad on its tour of England in 2006. Virat Kohli averaged 105 in the three-match ODI series which the India Under-19 squad won. Virat Kohli also performed remarkably against Pakistan’s U-19 cricket team later that year. Virat Kohli's father died in 2006 when Kohli was just 18. His father had been his biggest support and his untimely death plunged the family into a financial crisis. With more responsibilities on his young shoulders now, Virat Kohli began taking the game even more seriously. In 2008, Virat Kohli led the Indian team to victory at the 2008 ICC Under-19 Cricket World Cup held in Malaysia. Following this, Virat Kohli was bought by the Indian Premier League franchise, Royal Challengers Bangalore, for $30,000 on a youth contract. Virat Kohli was selected for the Indian ODI squad for tour of Sri Lanka in 2008. During the tour, Virat Kohli batted as a makeshift opener throughout the series as both the regular openers Sachin Tendulkar and Virender Sehwag were injured. India eventually won the series 3–2 which was India's first ODI series win against Sri Lanka in Sri Lanka. Virat Kohli continued performing consistently throughout 2009. Virat Kohli received his first man of the match award after scoring an unbeaten 79 against the West Indies in a group match during the 2009 ICC Champions Trophy. Later the same year he played in the home ODI series against Sri Lanka, scoring his first ODI century—107 off 111 balls—in the fourth match of the series. Virat Kohli continued with his good form which earned him a place in the 2011 World Cup squad. Virat Kohli played in every match in the tournament and scored an unbeaten 100 in the first match against Bangladesh, becoming the first Indian batsman to score a century on World Cup debut. 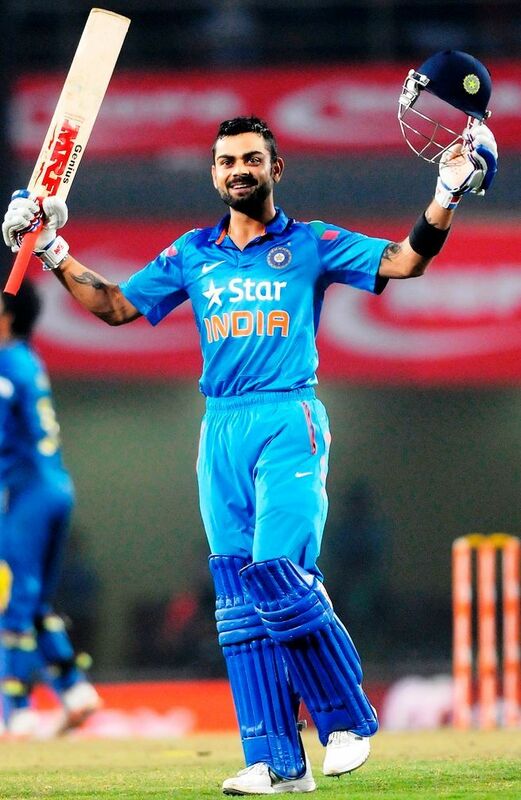 India reached the finals, and Virat Kohli scored important 35 runs in the finals against Sri Lanka. India went on to win the match by six wickets and lift the World Cup for the first time since 1983. During the India tour of West Indies in June–July 2011, India sent a largely inexperienced squad and Virat Kohli was one of three uncapped players in the Test squad. Virat Kohli made his Test debut at Kingston in the first match of the Test series. India won the Test series 1–0 but Virat Kohli was found wanting against the fast bowling. Virat Kohli scored just 76 runs from five innings in the series and was subsequently dropped from the Test squad. Virat Kohli was recalled to Test squad ndia's four-match series in England in July and August 2011, as as replacement for the injured Yuvraj Singh. Virat Kohli did not play in any Test match in the series and was moderately successful in the ODI series. Virat Kohli made his mark in the Test cricket during the India's tour of Australia in December 2011. India lost the Test series 4–0 but Virat Kohli was India's top run-scorer in the series. Virat Kohli scored his maiden Test century in the first innings of fourth and final match at Adelaide; Virat Kohli scored 116 runs in the innings. Virat Kohli was appointed the vice-captain for the 2012 Asia Cup in Bangladesh. In the final group stage match against Pakistan Virat Kohli scored 183 whilst chasing—the highest individual score against Pakistan in ODIs—and broke West Indies’ Brian Lara’s long standing record of 156. Despite Virat Kohli's great performances India could not progress to the final of the tournament. Virat Kohli's string of successful stints continued throughout 2013.Virat Kohli played well in the seven-match ODI series against Australia, striking the fastest century by an Indian in ODIs in the second match at Jaipur by blasting a 100 off just 52 balls. His innings of 100 not out helped India chase down the target of 360. Even though better known for his blazing performances in ODIs, Virat Kohli is also a skilled test player. In 2014, Virat Kohli was named the captain of the Indian test squad. In the Australian tour the same year, he amassed a total of 692 runs in four Tests—the most by any Indian batsman in a Test series in Australia. Virat Kohli's career saw a temporary slump in 2015 when Virat Kohli was unable to make any big scores. However, Virat Kohli soon regained his form and became the fastest batsman in the world to make 1,000 runs in T20I cricket during the South Africa's tour of India later the same year. Virat Kohli has been in terrific form in 2016. Virat Kohli's superlative batting performances helped India reach the semifinals of 2016 T20 World Cup, held in India. Virat Kohli started a charity foundation called 'Virat Kohli Foundation' (VKF), in 2013, for helping underprivileged children. The foundation also conducts events to raise funds for charitable causes. Virat Kohli won the ICC ODI Player of the Year in 2012 and the BCCI's international cricketer of the year for the 2011–12 and 2014–15 seasons. Virat Kohli received the Arjuna Award in 2013 in recognition of his achievements in international cricket. Virat Kohli was in a high profile relationship with Bollywood actress Anushka Sharma. The pair reportedly broke up in early 2016 and as per media reports they have patched up and are now back together. Virat Kohli is known his tremendous mental strength and one incident amply testifies it. When Virat Kohli lost his father he was in the midst of a Ranji Trophy match, playing for Delhi. He got a call at 3 am and came to know that his father has died. He was the overnight batsman for Delhi and his team was in a difficult situation. Virat Kohli scored a match saving 90 runs for his team the next day and went to his dad's funeral after that innings. Virat Kohli has an estimated net worth of $15 million.